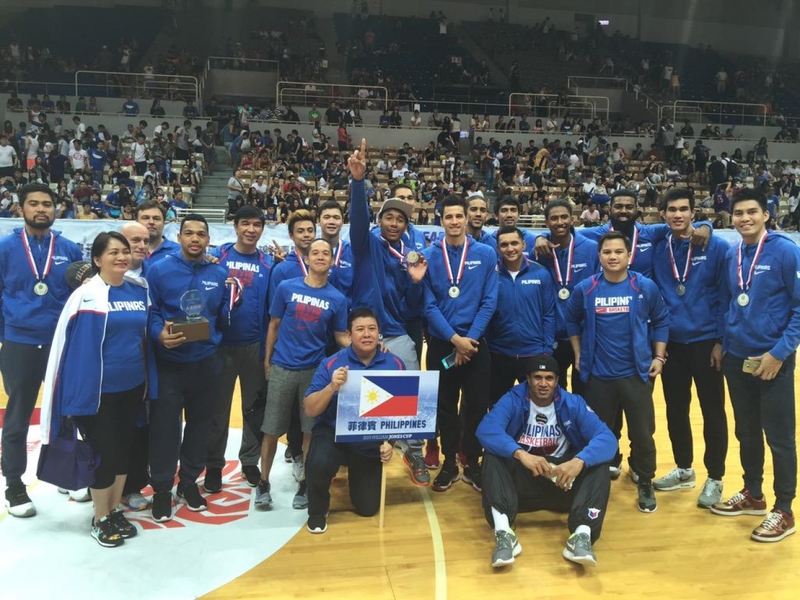 MANILA, Philippines – After a great comeback win over New Zealand last night and beating them in a week time, the Gilas Pilipinas closed the inaugural MVP 4-Nation Cup 2015 with a bang by beating another Asian Power House Chinese Taipei and winning the gold, 90-77 on Sunday, September 13 at the Smart Araneta Coliseum in Cubao, Quezon City. Although already assured of gold medal due to 2-0 start, Coach Tab Baldwin reminded the boys that their last game should not be taken for granted as they remembered the time when the Taiwanese humiliated us here in our home soil during the FIBA Asia Championships couple of years ago. Now is the time to avenge their painful loss. Team Pilipinas grabbed the 1st possession after the opening tipoff. Terrence Romeo started the point guard position to relieve their main man Jason Castro who opted to have a rest in preparation for the upcoming FIBA Asia Olympic Qualifiers. Romeo drew the first blood with a floater and immediately countered by Liu Cheng with a three-pointer. Andray Blatche who was really struggling in the rainbow territory from the start of the tournament connected with 2 long bombs. Another Liu Cheng trey plus a dunk from their naturalized player Quincy Davis III gave Taiwan a 2-point, 10-8 early lead. Blatche who is really racing against time to keep himself fit worked really hard in all departments. He sank both of his charities after getting hacked under the rim and dished out a dime to the wide-opened Terrence Romeo at the right corner for a three. Asi Taulava checked-in to give Blatche a well-deserved rest muscled his way up against 2 Taiwanese defenders and a foul and promptly followed by a short staff from Romeo. Calvin Abueva joined the outside scoring spree as he entered late in the 1st quarter. Matt Ganuelas-Rosser’s layup gave his team the 1st double-digit lead of the game 23-12. Lu Cheng Ju lifted up the scoring dry spell as he drained an uncontested three-pointer. Andray Blatche however, wasn’t able to beat the quarter buzzer. Gilas was up by a dozen, 27-15. Andray Blatche started the 2nd quarter with his 3rd trey and 11 in the 2nd. Gary David who was plugged in to fill-in Castro’s 12th spot for this game sank a three-point basket from the left corner, in front of Taipei bench. Last night hero against New Zealand, Terrence Romeo was looking good on the foul line compared to a horrible free throw shooting versus the Kiwis. But take note, his last 2 shots saved the Nationals from the very dangerous New Zealanders. Quietly, Liu Cheng and Chen Shih Chieh were the only players contributing offensively for their team. Gilas boys have already been playing for 3 competitive tournaments but they haven’t figured out yet on how to minimize their useless personal fouls. Again, they got into early foul trouble that sent the Taiwanese shooters to the free throw line and slowly trimmed the Gilas lead. Terrence Romeo went too fancy at their last possession by missing a behind the back pass intended to Asi Taulava. Team Pilipinas took a 15 minute half-time break with a 46-34 comfortable lead. After relaxing defensively in the 2nd period, Gilas Pilipinas started the 2nd half strong courtesy of Andray Blatche who was really feeling his hot hands and finally found his rhythm. Lin Chih Chieh single-handedly carrying his team on his shoulders to close the scoring gap. Over confidence is another serious problem haunting Gilas. Right before the game, everybody knew that a game against Taipei was almost non-bearing and assured Gilas a gold medal. The boys brought the lead up to 19 points. But they relaxed on the defensive end and gave Taiwan a room to recover and cut the lead to a single-digit, 64-55 under 2 minutes of the 3rd. Dondon Hontiveros who was missing in the 1st-half, rang the bell late in the penultimate period to bring back the double-digit lead 73-59, entering to the final canto of the tournament. Matt Ganuelas-Rosser threw a hammer down as he opened the 4th and final period while Marc Pingris made 2 baskets to give Philippines its biggest lead of the game with 20 points. Lu Cheng Ju and Tien Lei were too quick to react and lessened Gilas’ margin with 11 points midway of final period. Philippines’ once 20-point lead was downed to just 11. But Lu Cheng Ju wasn’t finished draining treys, he made his 21st point of the game that prompted Coach Baldwin to call a must ceasefire and adjust their game plan on how to neutralize Lu and ramp-up their lead. Coach Baldwin’s game plan was to send Terrence Romeo and Calvin Abueva in to bring back the energy and hustle on the defensive end. The American-Kiwi mentor’s adjustment seemed doing well as they got back the 2-figure lead 90-77 until the final horn sounded. The Filipinos complete the sweep with 3-0 win-loss record, beating all teams in the tournament while New Zealand bagged the silver after beating Moala Tautuua and the Tropang Texters 101-78 earlier. Talk ‘N Text will bring an international experience with bronze after stomping Chinese Taipei in the opening day.